A Teaching Box is a metaphor for an online assembly of interrelated learning concepts, digital resources, and cohesive narration. It helps to bridge the gap between discrete teaching or learning resources and understanding. Within a Teaching Box, an instructor or student can pick a topic, view the concepts that build an understanding of that topic, explore the online resources that support learning of those concepts, and benefit from the narration that weaves concepts, activities, and background information together into a complete teaching/learning story. 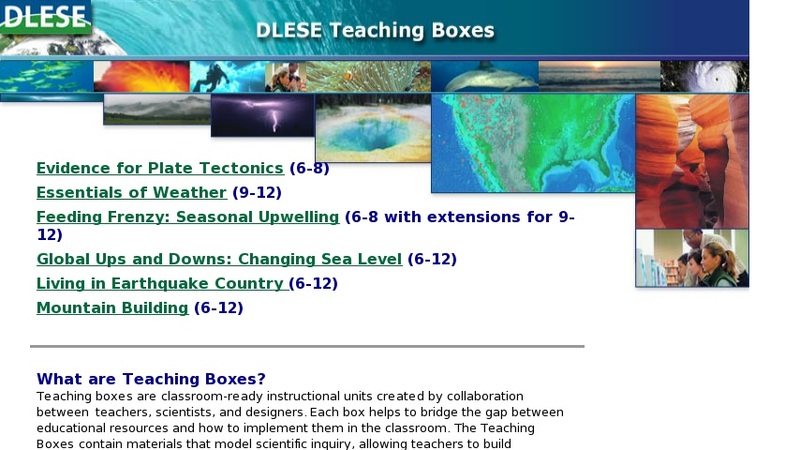 Teaching Boxes are currently available on the following topics: Plate Tectonics, Weather, Oceanic Upwellings, Changes in Sea Level, Earthquakes, and Mountain Building.